The Stamina InMotion E1000 Elliptical Trainer is a compact, pedals-only design that is small enough to fit underneath your desk at work. The portable “go-anywhere” appeal works for some people, but this machine is not practical for people who are looking for a real elliptical workout. This machine has an electronic fitness monitor that tracks the number of strides, time, and calories burned. It can also continuously scan all stats. 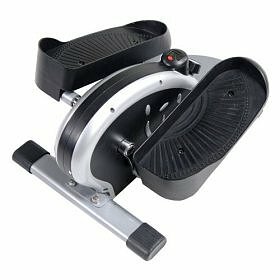 If you weigh less than 170 lbs, this sturdy little machine can blast the quads during a 20-minute workout. You can burn calories during a low-impact aerobic workout using this unit, although equipment experts will point out that this in no way resembles any kind of “elliptical” motion in the short stride. The main advantages to the Stamina InMotion E1000 model are the low price and the extremely compact design. This little machine gets mostly positive remarks in elliptical reviews. As long as you aren’t expecting a real elliptical trainer experience while using it, the machine works okay. Since the Stamina InMotion E1000 has no arms or console, you will work harder to balance yourself, and many users concede that they must use it placed close to a chair or wall so that they can hold on while striding. Reviewers also mention that the stride is (obviously) extremely short and can be more strenuous on the knees than a full-sized elliptical. Its pros are that it is easy to set-up and start using, very quiet, sturdy, and convenient to store out of the way. On the downside, the Stamina InMotion E1000 feels more like a stair stepper than an elliptical machine, and the short stride is just not that comfortable. We think even $150 is too much to spend on a machine that calls itself an elliptical trainer (it really isn’t one) and is backed by only a 90-day warranty. If you are on a tight budget, skip the Stamina InMotion E1000 Elliptical Trainer and view our discussion on Cheap Elliptical Trainers.